Explorations in Quilting and Life: Good news! I have been traveling again this past week but received the most welcome email while I was gone. 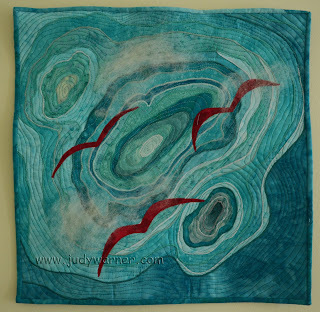 My quilt, View From On High, has been accepted into the Taiwan International Quilt Exhibition 2012. There will be two separate exhibitions at the National Tainan Living Art Center, Tainan City, Taiwan, from August 11-September 7 and the Taichung Municipal City Huludun Cultural Center, Taichung City, Taiwan from September 22- October 28, 2012. Needless to say, I am totally delighted that my quilt will be traveling to Taiwan! Congratulations Judy! A well-deserved honor! Congratulations, Judy! A wonderful honor. I also will have work joining your beautiful quilt in Taiwan. Happy dance time! Congratulations to you too, Linda!